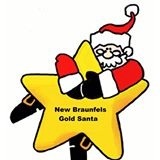 Century 21 New Braunfels office is having a garage sale Saturday, Sept. 24th to raise funds for our GOLD SANTA program. This program provides Christmas items for local underprivileged children. If you have things cluttering your closets, garage, yard, or storage units we would sincerely appreciate you donating them for our garage sale effort. We can pick up items from you, or you can drop them off any time you’re in the area of our office at 190 S. Seguin. Nothing is too little nor too big for us to handle. Or, if you’re looking for something at a real bargain, stop by on the 24th and shop. I always look for good books at sales like this. Everyone loves a good book!